Thanks man, without you this never could have happened. Baby is asleep, time to buckle down and unburden these brown boxes brimming with bounty. Hmmm this is fun – baby, buckle, brown, boxes, brimming, bounty, books, bottles, boots, berries, blueberries, baking, baking blueberry buckle – brilliant! Sorry brown boxes, you have been bumped to the backburner while I bounce to the kitchen, don the “bacon is meat candy” apron, and ride this alliteration bandwagon all the way to buckle town. It’s time to buckle down! You’ve never heard of buckle? You poor dear. Here, sit down, let me get you a cup of tea. Alright, now that you’re settled, let me explain. There are people out there in the world who like pie, berry pie in particular. I know because I am one of them. But there are also people out there who adore coffee cake (even if they pair it with tea instead of coffee as I do). I know because I also fall in this camp. And then there are people, enlightened people, who have their berry pie and eat their cake too, all in one baked goodness. 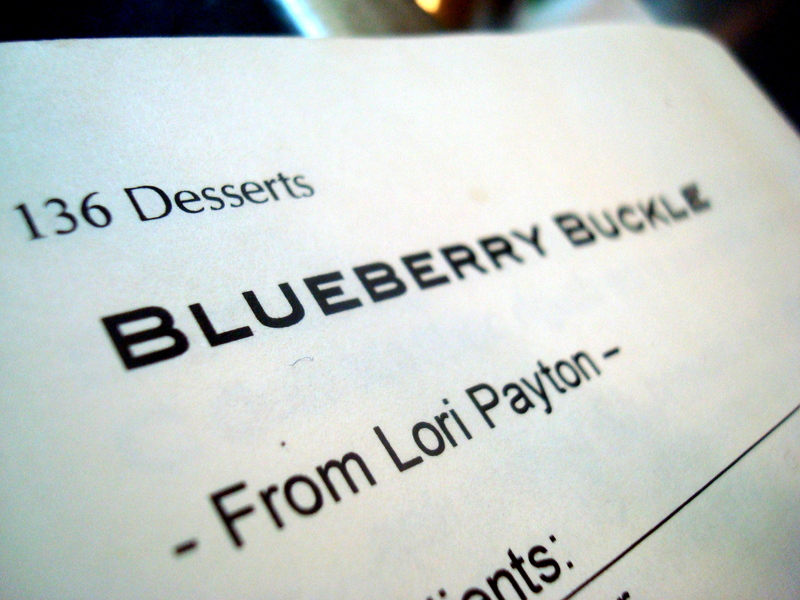 Ladies and gentlemen, it is my greatest pleasure to introduce you to an all time family favorite: Blueberry Buckle! 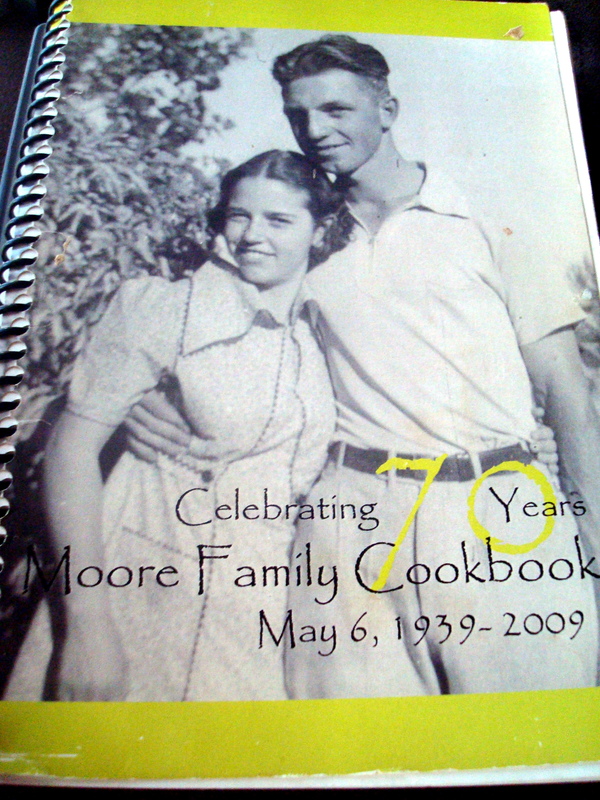 This recipe is on page 136 in the Moore Family Cookbook, created by my whole extended family when celebrating my grandparent’s 70th wedding anniversary. If you think that’s a long marriage, try to imagine them celebrating their 74th wedding anniversary just a few months ago! Hooray for longevity, and for a hospitality-centered family!!! Are good looks and cooking abilities both genetic? This recipe was submitted by my mother and I left the ingredients list exactly as it is in the cookbook although I do often have quite a few variations which I’ll talk about as we go through the play by play. Once I wrote a detailed account to a friend in a mail art letter (more on my love for mail later) on all the nuances necessary for producing the most bodacious buckle without a blip every time, but I lost my copy of that so we are back to the tried and true mom version. 2. Collect all the ingredients before you start. I know this may sound silly but gosh my baking days are kept carefree when I know where everything is before being up to my elbows in butter and flour only to discover that I’m out of eggs or baking powder. 3. 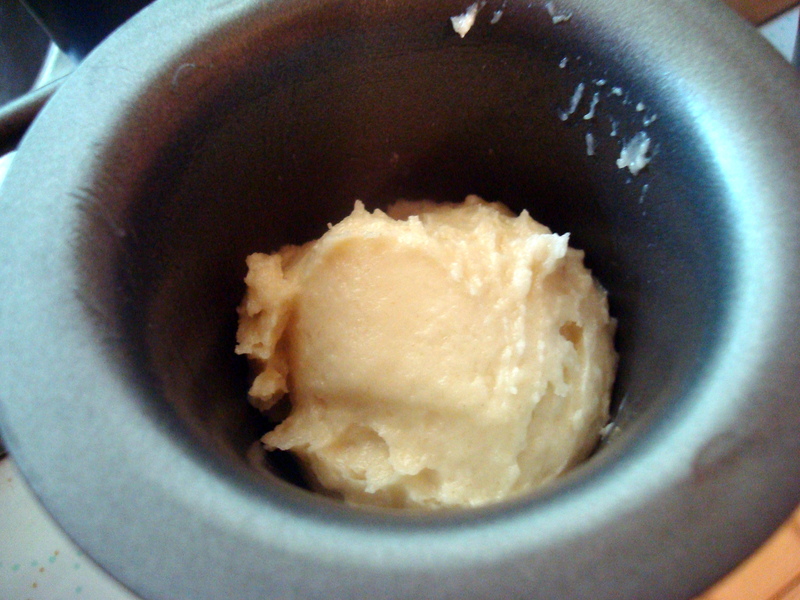 Cream together the egg, sugar, and room temperature butter. Usually I use an electric hand mixer for this part but either I haven’t unpacked it yet or I strategically hid it from myself somewhere in the kitchen. I’m really hoping it’s the first option, I’ll be really upset with myself for hiding basic kitchen tools when I need them. I mean really, is this my idea of a joke? It’s not funny. I can be so inconsiderate sometimes. After that little anger management moment between I and myself with me being the mediator, I soothing suggested that this handy dandy whisk would work in a pinch and we all moved on. 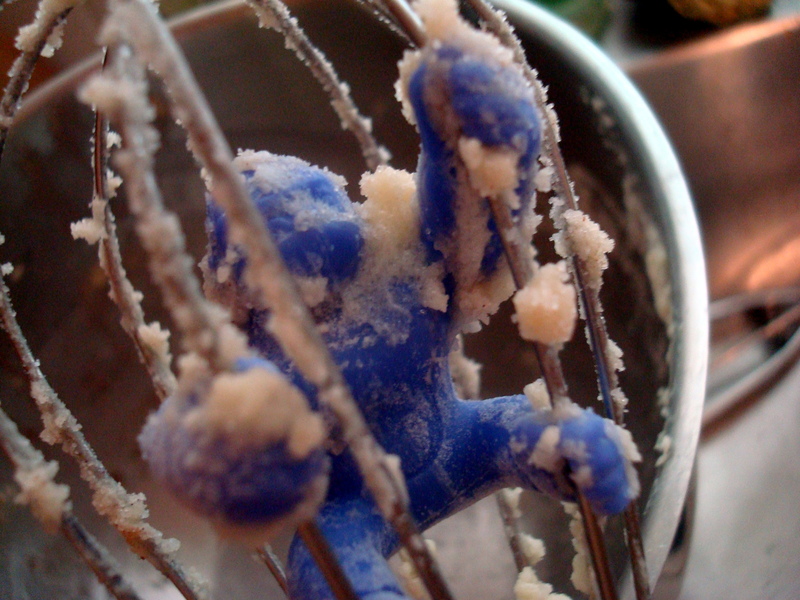 Donkey kong is a whisk master! 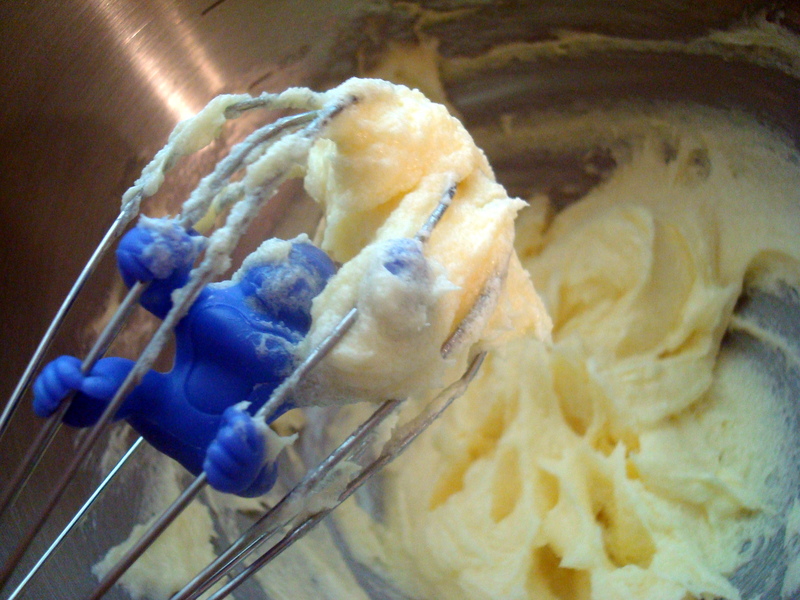 And wow did this whisk work up a great creamed goodness. I was really impressed with myself though this caged animal energy probably had a lot to do with it. 4. 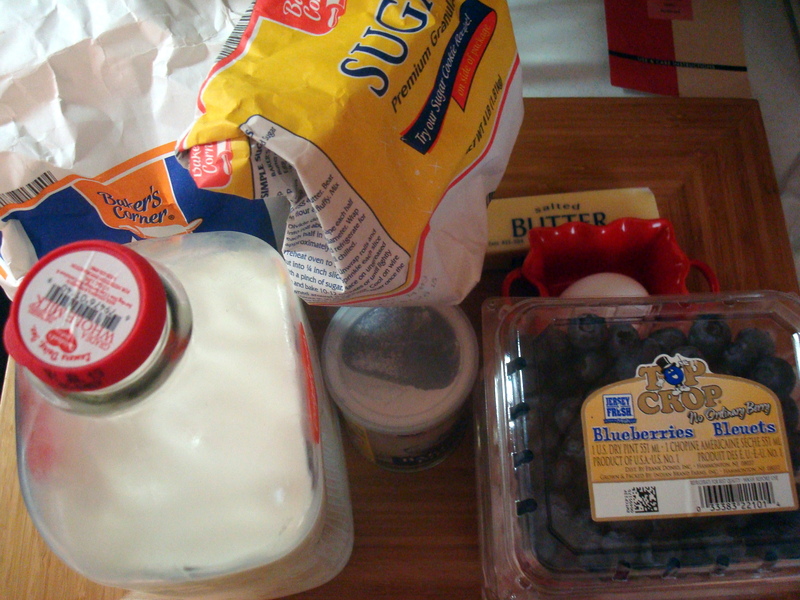 Now in the recipe is says to sift together the dry ingredients (but not the berries) and then add them to the egg mixture, alternating halfway with the milk. This is a good idea and I’m sure it has great baking benefits, but I’ll let you in on a little secret – if you dump the dry ingredients over the egg mixture starting with the flour, gently mix the baking powder into the flour, begin to mix the flour layer into the bottom egg mixture while slowly adding the milk, it will still turn out super tasty. *I also try to use cream when possible and make sure its a generous 1/2 cup. Since I didn’t have cream on hand I settled for whole milk and it was still good. 5. Spread into greased baking dish. My mom uses a round springform pan or an 11″x7″ pan and I admit her buckle is the best because it is made by my mom, but I have never had much success by using either of those options myself. I have found that the very center of the cake never fully bakes, or if it does, the outside has been baked bone dry and has lost most of it’s cake appeal. 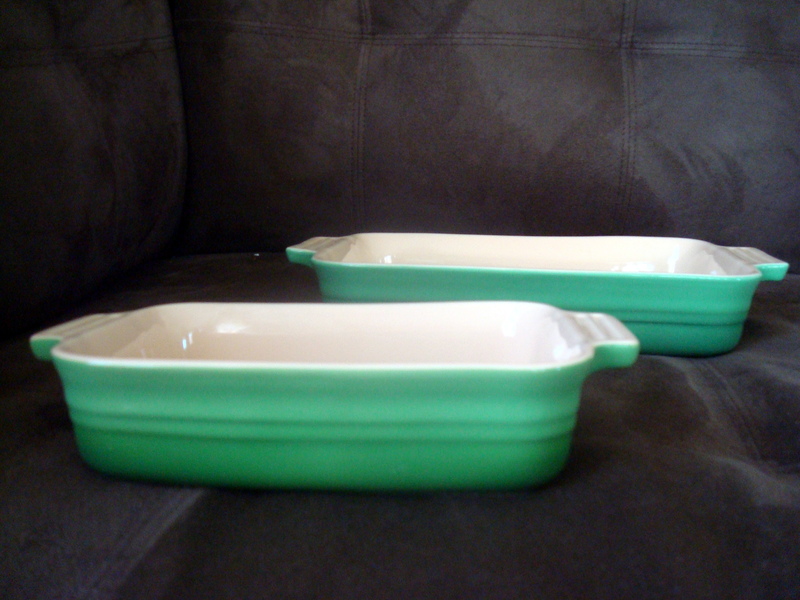 This time I experimented with two different baking pan options. 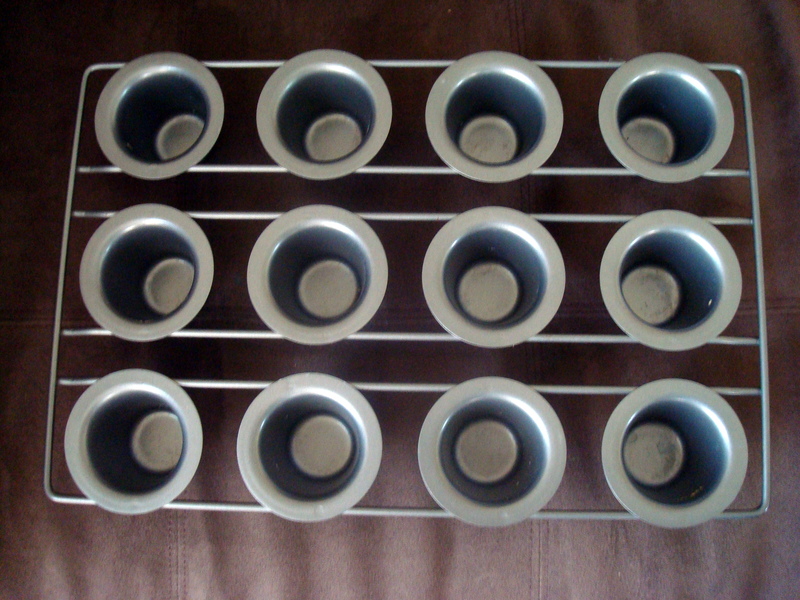 Here is a 7″x5″ Le Creuset bakeware pan. And here is a mini popover pan. I’ve never tried freezing buckle before but I’m going try it out. I want to have them on hand for a rainy morning brunch or an unexpected tea party. I greased them down with coconut oil and they slide out without a problem. 6. Drop one small scoop of batter into each popover cup. I use this handy dandy scoop which is approximately 2 tablespoons. Come to think of it, I use this scoop alllll the time, but I’ve never once used it for ice cream. That will be remedied soon enough! 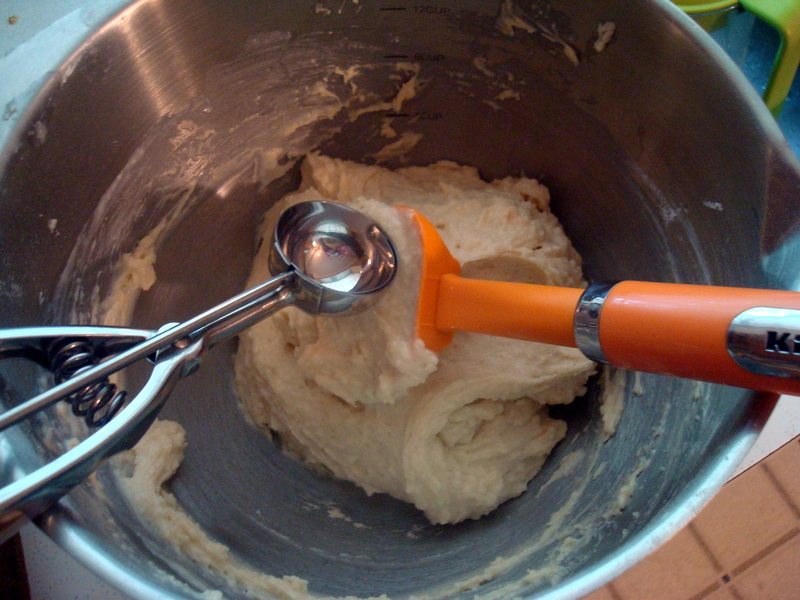 After filling the popover pan, I scooped the remaining batter into the 7″x5″ pan. 7. 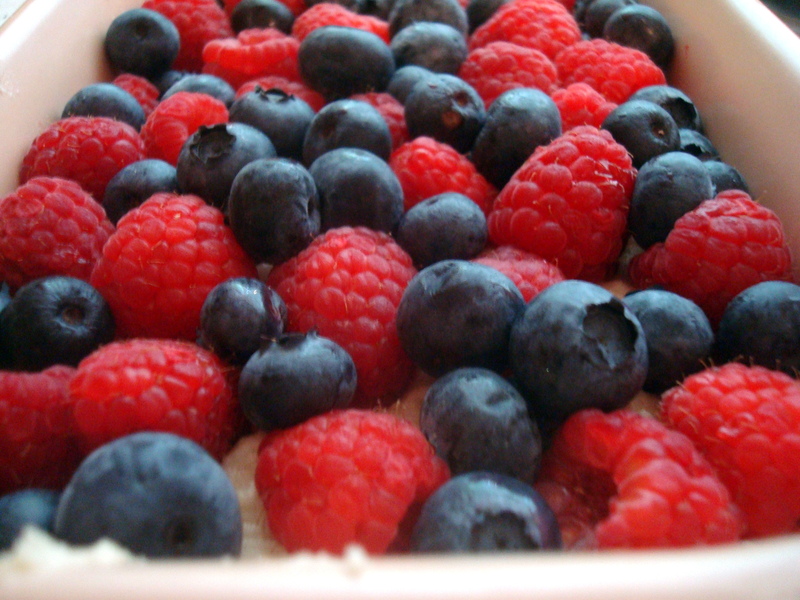 Plop a few berries over the top, just enough to cover the batter. Although the recipe calls for 2 cups of berries I’ve actually never measured, I just make sure the batter is covered but it you put on too many berries it will be difficult for the batter to bake evenly. Notice that it’s not all blueberries down there? That’s because it’s berry season here in the upper MidWest and my fridge is filled with raspberries. The best way to make buckle is to grab the cheapest berries available. My mom has made blueberry, blackberry, raspberry, and fig. My personal favorite is raspberry blackberry. 8. 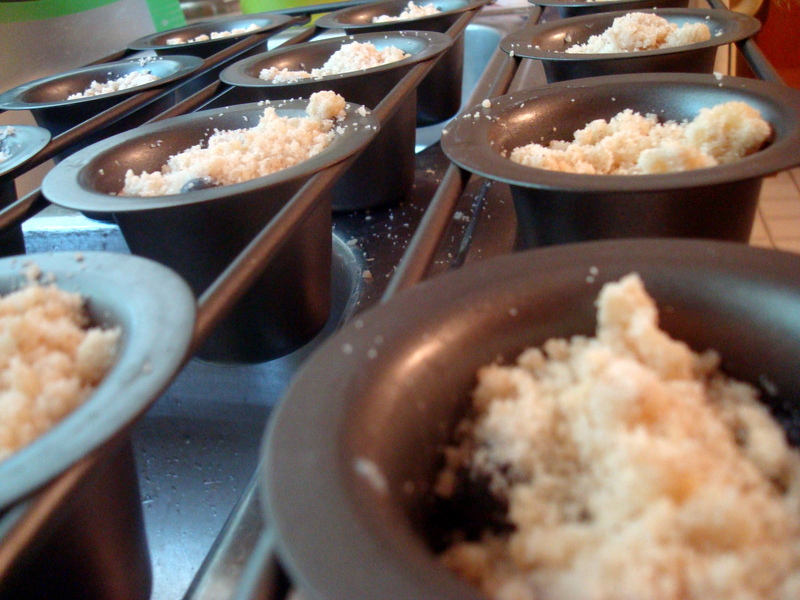 Create the topping streusel stuff by mixing together the sugar, flour, and cinnamon. I also add a dash of nutmeg or ground cloves because I love those two spices. Then cut in the butter till you have nice pebbly bits. A food processor would be idea, but I ended up just using my fingers to crumble things up to my satisfaction. Distribute this evenly over the berries. 9. Bake in the oven till the berries are all bubbly goodness, the streusel topping is toasty gold, and the cake underneath has baked up nice and firm. 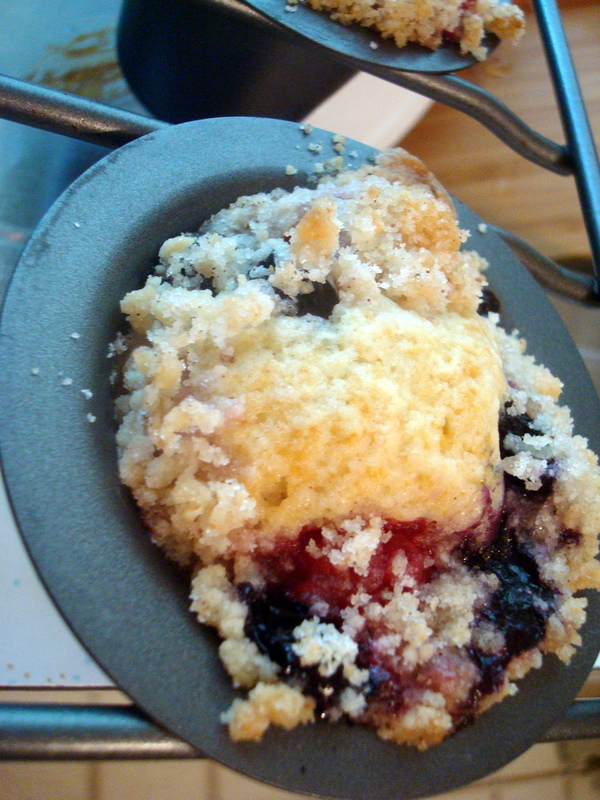 This is a tricky thing to tell because the berries and streusel make it difficult to judge if the gooey stuff is unbaked cake batter or just berry/streusel good goo. Honestly, you’ll either get lucky your first time or have to practice a few times (with a lot of taste testing involved each time) till you get it just the way you like it. What a pity. If you are using the 11″x7″ or springform pan bake for 55 minutes. I put the popover pan in for 16 minutes, could tell it wasn’t ready, and put them back in for 5 more minutes, so a total of 21 minutes. They were juuuuust a tiny bit dry and probably could have come out at 19 minutes. The 7″x5″ pan went in for 35 minutes and it was divine. Now this is really best served warm and fresh, or at least on the same day it was baked. I froze most of the popover bites and will let you know how they do down the road. 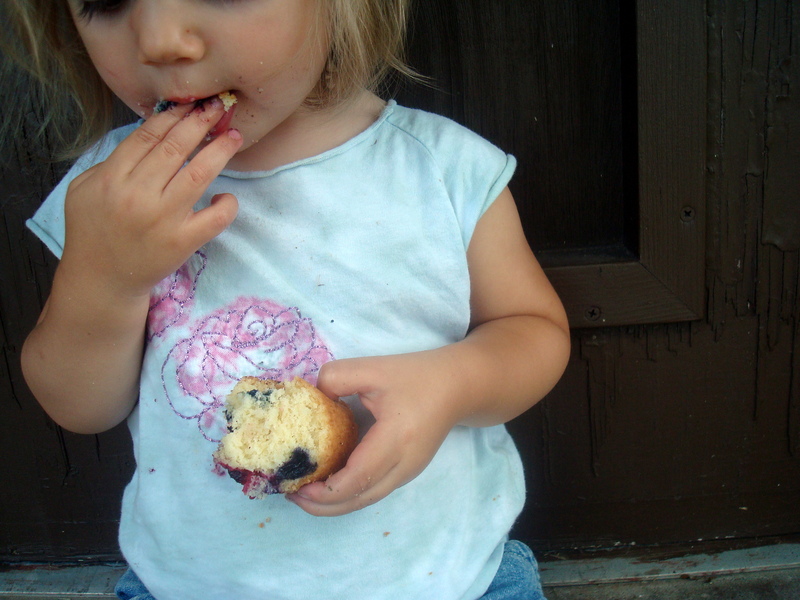 Hummingbird gave her full approval of the kid friendly sizes for the popover buckle. 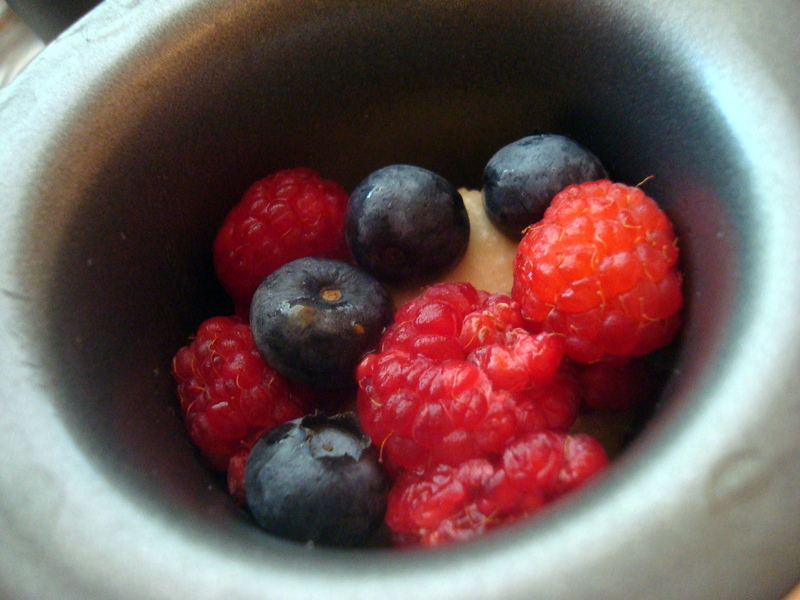 Although I love the little portions, I was a little disappointed by only having a few berries scattered amongst the cake, I’ll probably add a few more berries to the popover cups next time. The berry to cake ratio for the 7″x5″ was perfect. So were you familiar with buckle before or is this your first glimpse into the goodness that awaits? If you have a buckle recipe, I’d love to compare notes and hear about what you do differently! Yum! Love the pics, of course, and the meandering through the recipe. 2. Have you tried the Brownie Pan, or do you think it would be kind of like the muffin tins, only square? They may give you more surface area for the berry-goodness. 3. I just made buckle with the last of our rhubarb last week. It was yummy. I added almond extract to the batter. Mmmmmm. I also tried a different pan-a 9″ springform pan-but was not too happy with results. The cake was higher and the whole thing wasn’t juicy-moist enough for us. I think I will go back to my 11″. Hug the Hummingbird for us! Hmm, I have some rhubarb tucked away in the backyard. Maybe I’ll try making a blueberry rhubarb buckle next! Thanks for the idea! Thank you! Love the fun recipe and photos! Boy, you sure are your mom’s daughter! I can feel her personality coming through strong, through you! 🙂 I’ve heard of buckle but never made it, now I’m excited to try! This is wonderful! I love hearing about your family and the descriptions with the photos all along the way. The final product looks amazing. Yum indeed!